So as 2018 draws to a close, it seems that Trader Joe’s has committed to two food products: sugar and cauliflower. The vast majority of the items I’m writing about are super sweet. I was more than happy to give my palate a break. While I don’t mind cauliflower sneaking into more items, but for me, it needs to be done well. This item, it was not done well. Here is an item that all the individual components are fine. Except for the riced cauliflower. My cauliflower looked like it had been well pureed. Not a deal breaker, but that lead to another issue, the components here just didn’t seem to come together harmoniously. 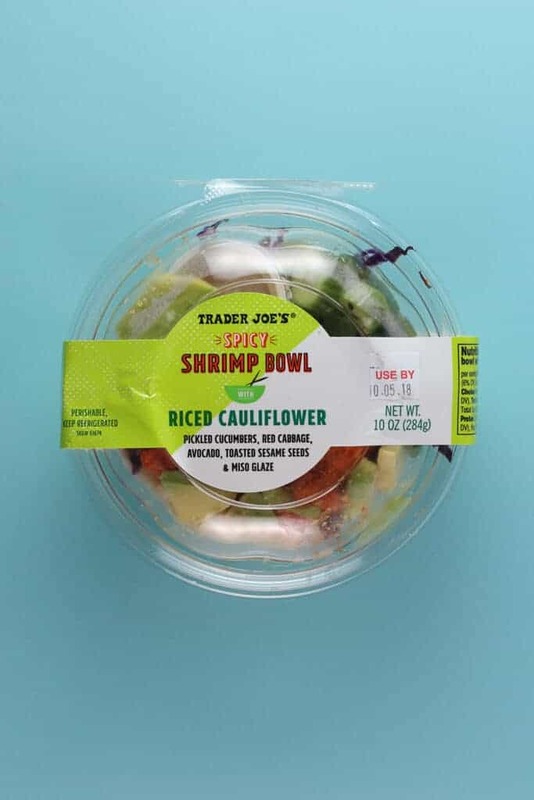 This in some ways, is meant to be like a sushi bowl in the same way Trader Joe’s Smoked Salmon Poke Bowl tried to be like a deconstructed sushi roll. This tries to be like sushi in some of the same way, but without the textural and important detail of the rice. Now, don’t get me wrong, the rice in Trader Joe’s Smoked Salmon Poke bowl was the low point for me. In good sushi, the rice is well-flavored and seasoned with each of the grains maintaining their individual texture. If you’ve had not great sushi, it comes down to the rice. But here, the cauliflower has been obliterated into a mash or puree. The other elements were fine. The avocado remained fresh and green through some miracle of culinary science. The red cabbage was fresh and crunchy. The sriracha shrimp were hot and spicy. The miso glaze was flavorful and a bit sweet, but I’m not sure it complimented everything in this bowl. The pickled cucumbers were the first thing I smelled when I opened this container. Not everyone loves the aroma of pickled veggies. But as a team, they were like the Avengers in the movie Captain America: Civil War. They all ended up breaking into two separate teams. If this bowl were reorganized, they could take some of these elements out to make a more harmonious union. One thing I can agree on is the calorie count. If you eat this whole bowl, it will be fewer calories than most of the other refrigerated meals at 170 calories. But I only managed to get half way through it before I let it go. The cauliflower mush was just a bit too much for me to enjoy with the other contents of this bow. For $4.99 I would proceed with caution on this one. It’s not going to be a universally loved and adored item, but it seems to be low in calories, dairy free, and does have some decent components. 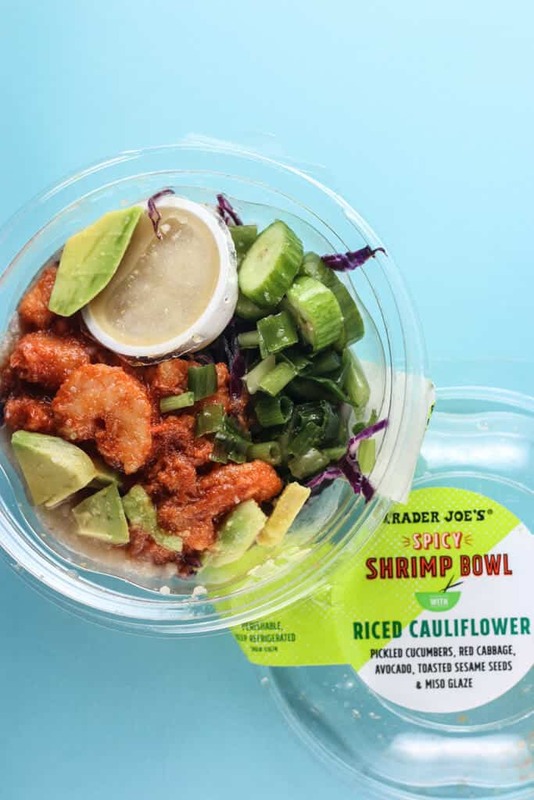 Would I buy Trader Joe’s Spicy Shrimp Bowl with Riced Cauliflower again? This is a buy once and I won’t be reaching for it again. 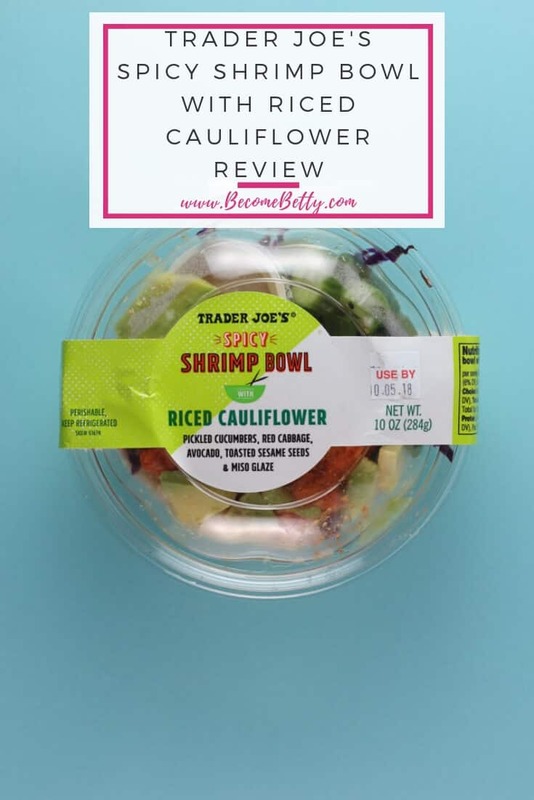 Product Description: A spicy shrimp dish with riced cauliflower, pickled cucumbers, red cabbage, avocado, toasted sesame seeds and a miso glaze. A new sushi inspired bowl from Trader Joe’s that takes out the rice and replaces it with riced cauliflower. 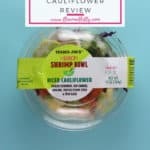 I noticed tjs is testing with cauliflower in many dishes. Roasted cauliflower would be better. I wonder if you’re supposed to mix it all up together…? Although that cauli rice sounds like such an epic fail. I feel like a weirdo who isn’t on board with cauliflower everything all the time- i do like cauliflower a lot but at some point it’s like, enough already- it doesn’t taste like rice, it tastes like flipping cauliflower! Great review and I love the Avengers reference – totally get it and I’ll probably steer clear of this one. 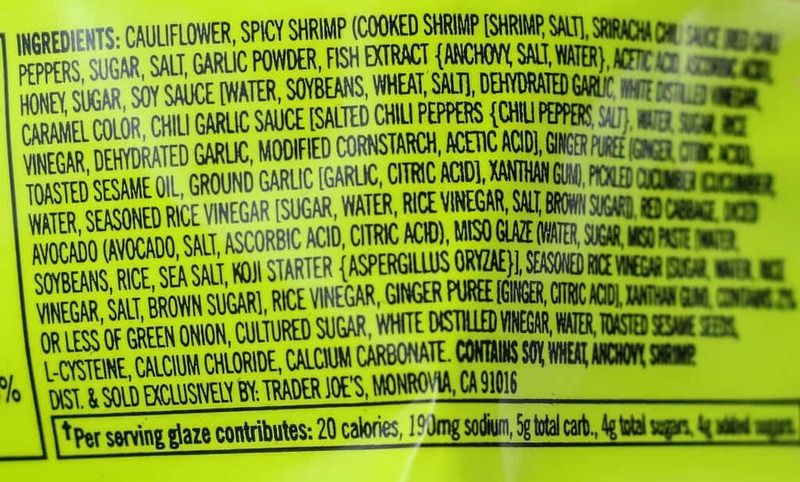 I’d be someone this normally appeals to, and probably would have given it a shot, but at 850mg sodium it’s really high for a bowl that seems to be healthy-focused. So it’s a pass from me. 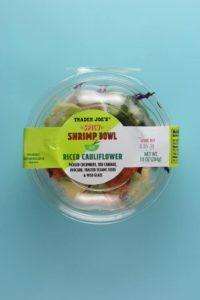 Tried this today and it is my new favorite bowl at TJ’s. It’s about time they placed a carb friendly lunch option in their deli area that doesn’t contain dairy and even explicitly states how many carbs the dressing alone contains. My only suggestion might be to make a bigger portion, but they did not skimp on the shrimp either. Keto-friendly as a side or quick bite! And delicious. I was pleasantly surprised… These are all things I love. Hey Velvetunit! You are right about the carb issue and thank you for pointing that out. I’m actually working on a roundup post of Keto friendly items (my Mom does Keto). I’ll absolutely add this to the list of friendly lunch options! Thanks so much for stopping by! I am trying this right now and as another low carber, I’m sold. This is awesome! To get more calories and protein (I’m trying gain some weight), I added a block of their siracha tofu. I loved the combination and will.definitely buy again. I just had this for lunch. I am on a no processed carb food plan and this hit the spot! Hats off to Trader Joe’s for creating a grab and go meal for my people. I personally found this to be a 5 out of 5 in all categories! Taste, affordability(with the generous shrimp and avocado portions) as well as purchase again. 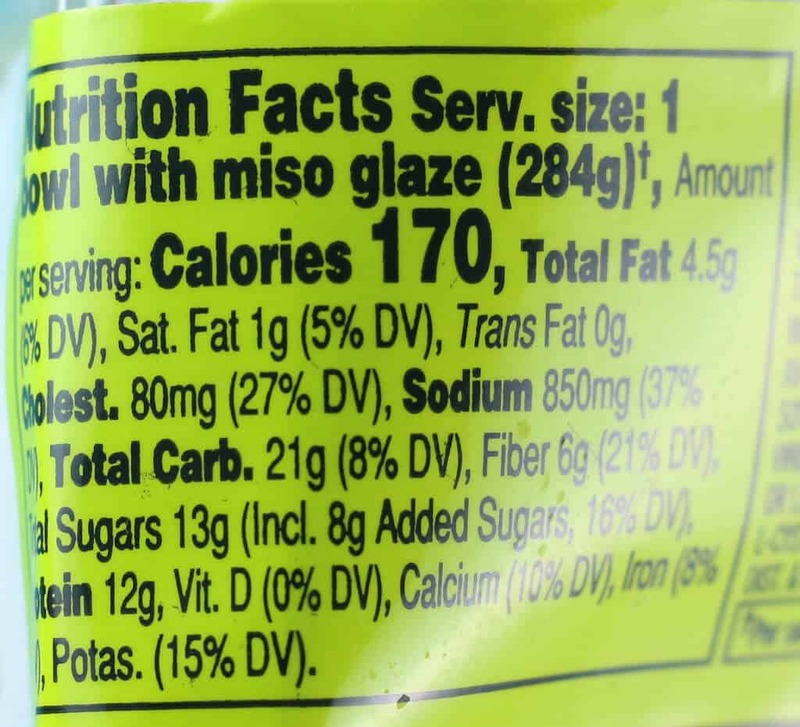 I googled it because I wanted to see nutritional value as I threw the outer wrapping out at the store. Hey Alyce! Your thoughts are always welcome here even if you don’t agree with me. Thanks again for stopping by and sharing your thoughts on this.